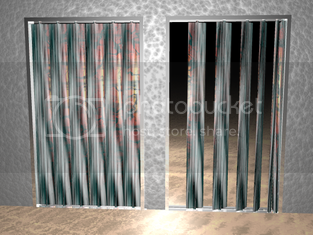 This door is made of slats, each 4 - 6 inches in width, made of brushed steel. They sit on a track that runs between the two sides of the doorjamb. You walk forwards and the door opens when you get close to the motion sensor. It opens like this: each slat turns 90 degrees and slides flat against the wall. You walk through, the slats return to their positions, and execute another 90 degree turn and are a door again. can we have a drawing please ! + I like it, but after that Kramer thing, Im awfully suspicious you stole it somewhere. I am concerned by the strength of the door and the ability to resist the elements. A lot of holes when open means it needs to effectively seal a lot of holes when closed too. Of course I'm thinking of flimsy window blinds when I imagine this, but even steel would have trouble being thin enough to be effective and still strong enough to keep out a good hard kick to the right place. Unless they were posititoned to reinforce each other somehow, or arch together to put pressure on the door frame or... yeah, now I'm confusing myself without an appropriate picture. //Think vertical blinds.// - thanks [Phoenix] that makes sense. a bun as long as it does indeed make a whooosing sound. I'm doing some 3D modeling of ideas, and so I've got a nice pic for you guys. Second linkie.